I have plenty of WIPs, but what I want to share with you today is an FO that I’m really excited about. 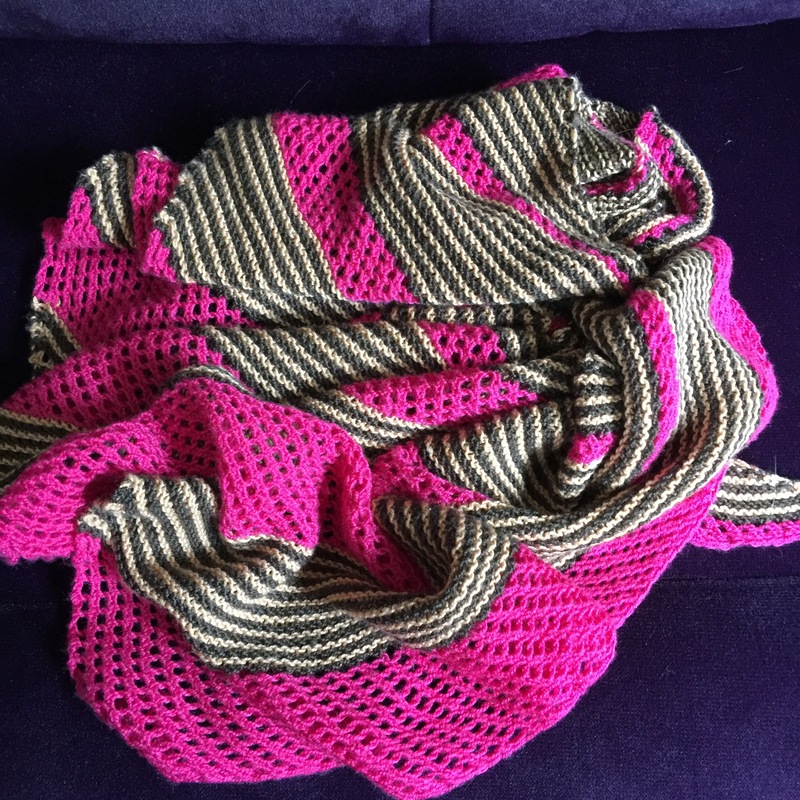 So, over the summer I started knitting again after a bit of a hiatus, and it quickly became my best form of therapy. 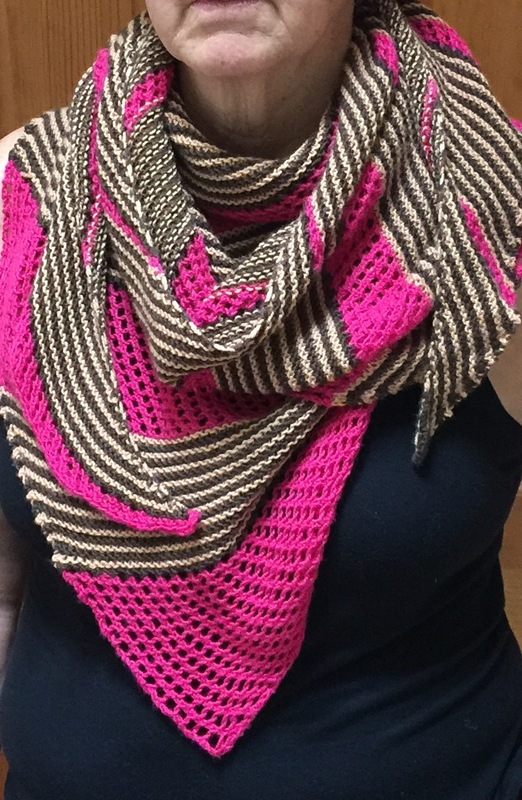 I started doing projects that pushed me as a knitter and this was really the first of those. 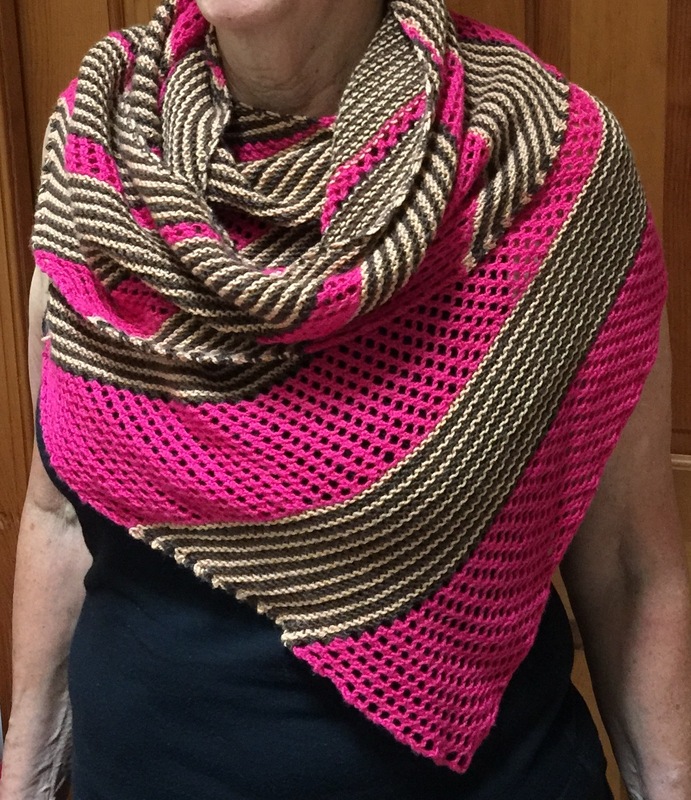 I finished the knitting almost two months ago but didn’t get around to weaving in ends and blocking until recently. Many thanks to my mom for her excellent modelling services! I LOVE this project. It’s for the wifey, but I hope she won’t mind if I borrow it from time to time! I followed the pattern as written. I would definitely make this again. I like the yarn all right, but it’s not my absolute favorite as it’s just a little splitty. 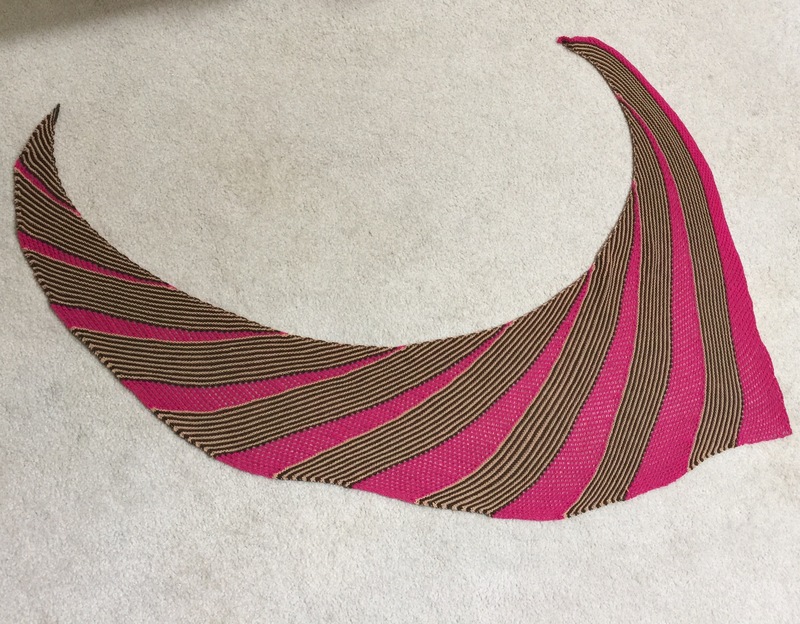 I was worried initially that it wouldn’t be big enough but it grew a lot with blocking–from about 30″ x 53″ to about 38″ by 65″, even though I didn’t block it super aggressively. The pattern was a little challenging at first but once I got into it, it was very straightforward. The only really tricky bit was keeping track of where to turn around for the short rows (in the mesh sections). I started using a stitch marker pretty early on and that solved that problem. It knits up quickly and, despite having a lot of garter stitch, isn’t too monotonous since the mesh panels break it up a little. Overall, this was a great project! Your shawl reminds me of those high speed photos or film of streets of zipping cars. Love it, what a fantastic color palette too! Thanks 🙂 My mom is pretty cool–I live vicariously through her all the time! 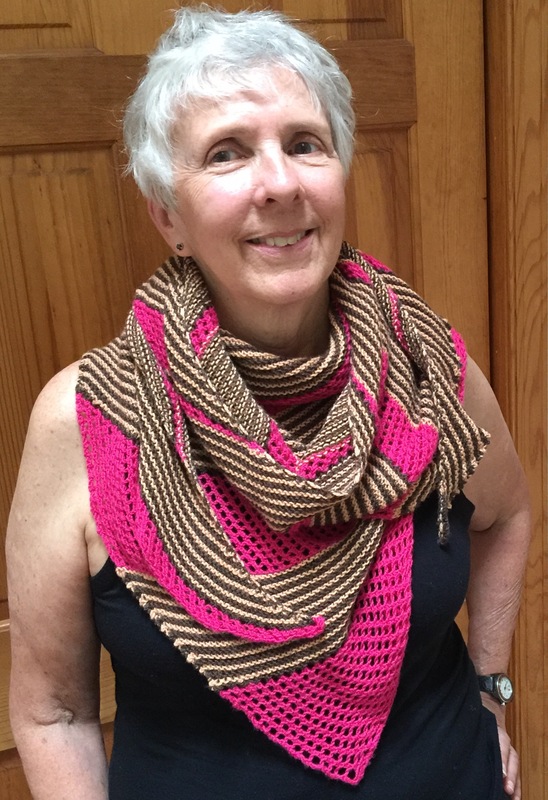 I’ve made two of Melanie’s patterns so far and love them both–I would highly recommend just going for it! This is AWESOME!!! The colors are PHENOMENAL!!! It is in sock yarn!!!! 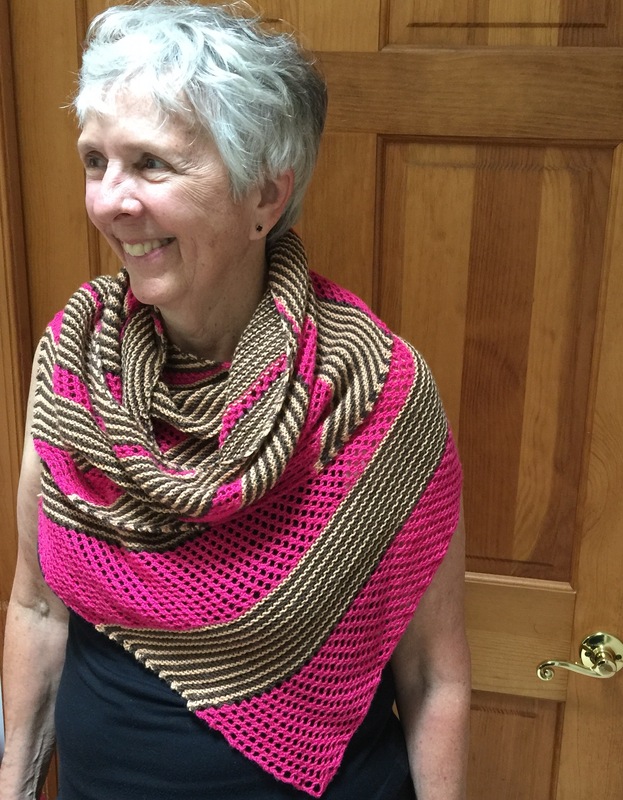 You are a knitting rock star! You deserve even more exclamation marks!!!!!!! I love the colors. This is gorgeous!